Have you ever grilled pears? OMG, they're delicious! I love a good summer salad but I get bored with my same old go-tos and incorporating fruit that's in season is a great way to add excitement to your salads. Pears are currently in season, starting with California pears from the end of July to early September, leading into Canada's own BC and Ontario pears until early October. I feel like pears don't get as much attention as other, more exotic fruit of the season such as peaches, cherries, or mango. But these guys deserve some attention too! Rich in vitamin C, potassium, folate, and fibre (all nutrients we can use more of in our diets), pears are convenient, and less costly than other fruit. 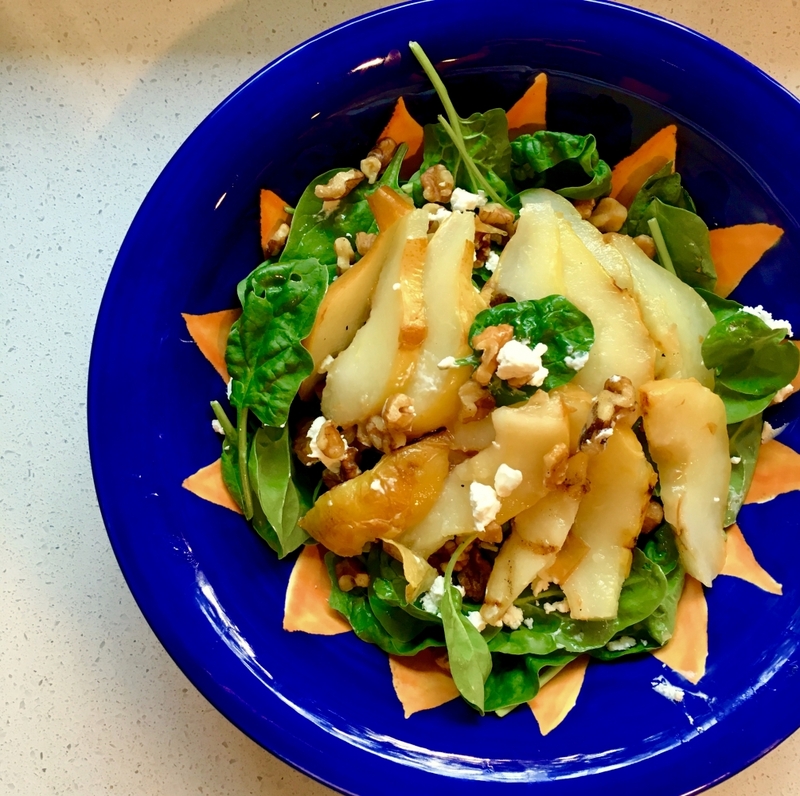 Grilling the pears brings out their natural sugars and flavours which pair nicely with the bitterness of the walnuts in this salad. I chose walnuts for their rich source of omega 3 fatty acids, and goat cheese as a neutral flavour (if you want a bolder flavour, go with blue cheese). Use as a side dish or make into a complete meal by adding grilled chicken or shrimp. 5) Once the pears are done, allow to cool slightly and then slice both halves. Add to the top of the salad. Drizzle the dressing on top (you might not need all of it, start with 3/4 - I always like to make slightly more than needed just in case). As a main dish, my husband and I gobbled this up no problem. As a side dish, this recipe will serve 4 people. Good food, good health. Enjoy!